Dripool Are The UK's Only Designers & Manufactures Of Automatic, Swimming Pool, Safety Covers. Founded Over 30 years Ago , Dripool Continue To Lead The Way With Installations Throughout The UK And Beyond. Whether Rectangular Or Free Form, Infinity Edged Or Deck Level, Existing Or New Build, Indoor, Outdoor, Domestic Or Commercial, Dripool Have The Perfect Solution To Ensure Safety, Heat Retention & Debris Control On All Shapes & Types Of Pool. KB Pools has offered a superb professional pool and spa service for over 25 years throughout the South Coast of England. Our company has installed and serviced a wide range of swimming pools and spas that been built to our customer’s specifications. On every job, we will provide highly trained, and experienced pool builders and service engineers who will help bring your dream pool or spa to life. Some of our staff have over 20 years of experience in the industry and will be able to provide service and aftercare of the highest quality. 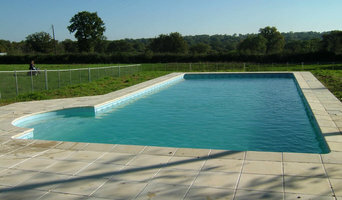 Bluepools is a family run business, which operates out of Salisbury, Wiltshire, and serves the Swimming Pool industry all over the United Kingdom. Current projects range from small domestic swimming pools and spas to large indoor public pools for recreation and schools. We offer a unique approach to building your swimming pool - as consultants and designers, we will be on hand to help you with all the technical aspects of designing and building swimming pools, from initial concept right through to finished detail. We will give your local, trusted builder all the knowledge he/she needs in order to build your project to a safe operational standard. In short, we will be at the end of a telephone at all times to make sure your project runs as smoothly as possible. Just give us a ring - 020 3372 4482, London Office or 01722 504818, Salisbury Office. Cranbourne Stone Ltd is the UK’s leading specialist in swimming pool surrounds and natural stone products. The Cranbourne Team produce and stock the largest range of Pre-cast & Natural Stone Swimming Pool surrounds in the UK. Cranbourne understand that no project is the same. The desire for individuality is the key to the business. Working with Pool Installers, Architects and Landscapers etc., the company provide an on-site template service and are able to work from customers’ templates or emailed CAD drawings. The relationship with their customers is of the highest importance to Howard & Jo. Being a growing family business, the quality, price and service provided is always their highest priority After 10 years of trading, Howard & Jo are overwhelmed with the continued support of their loyal customers and look forward to another 10 years of expanding and designing new products and I have no doubt we will have more to tell you about us. Having built prestigious swimming Pools for over 20 years for the family swimming pool installation business, Howard, the Managing Director of Cranbourne Stone, recognised the demand for a better quality pool surround. Understanding the complexity of swimming pool installation, in 2004 Howard and his wife Jo, decided to form Cranbourne Stone Ltd and started to supply White & Buff Pre-cast copings to swimming pool installers nationwide. Over the years, the demand for Natural Stone increased, so they decided to source suppliers, world-wide, for suitable stone for swimming pool surrounds. The company now imports from over 10 countries world-wide and is always searching for new stone, to keep up with the ever changing trends. After years of cutting & shaping Natural Stone with basic bridge saws and hand tools, the decision was made to invest in a CNC 5 axis bridge saw machine, which has had an overwhelming effect on the business and has allowed the company to enhance the company portfolio tenfold, including the selections of Deck Level Grilles and Stone Wall Art, which can be seen at the Showroom & Display Area at the working yard in the beautiful Hampshire Countryside. 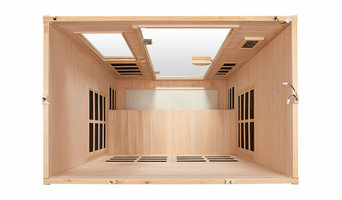 Happy Hot Tubs bring you the world's most popular hot tub brand, alongside an unbeatable standard of customer service. We pride ourselves in being the ultimate one-stop shop for all your hot tub needs. Our range of spas is unrivalled, and we have something for every budget and lifestyle requirement: from the market-leading Highlife NXT Collection to the affordable and compact Freeflow hot tubs. BISHTA, the British and Irish Spa and Hot Tub Association is a member of the BSPF, the British Swimming Pool Federation. BISHTA exists to promote high standards of safety, enjoyment and value, by registering suppliers of spas, hot tubs, accessories and water purification products. Design & Manufacture of fibreglass and mosaic tiled spas & pools. Spruce Pools are swimming pool specialists who offer the complete swimming pool construction, renovation, repairs and maintenance service in Wiltshire, Dorset, Hampshire and Somerset We build swimming pools to bespoke or standard shapes and designs, both for above and in ground pools. We also provide the materials and practical advice for DIY self-build projects and we often work alongside building contractors and architects on new pool installations. Established in 1994, Spruce Pools is a family-run business based in Salisbury Wiltshire with a team of full time construction and service staff. With over thirty years pool industry experience, we have an excellent reputation for our quality builds, attention to detail and all round great service. We are proud to be members of the swimming pool and allied trade association (SPATA) and all our work is carried out to the strict guidelines that SPATA set down for pool builders to follow. Of course, we don’t all have the room, money or climate for our own swimming pool, but hot tub prices are usually less than swimming pools' and are a more compact, weather-enduring option, too. With Southampton, Hampshire hot tub suppliers available on Houzz, you can compare prices, photos of hot tub installations, reviews, recommendations and ratings from previous clients. 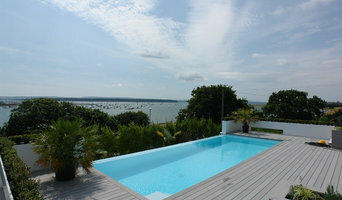 How will Southampton, Hampshire hot tub and swimming pool builders install my pool/hot tub? As with all building projects, hot tub or swimming pool installation will start with the design. Usually your swimming pool designs may have to be adjusted once you’ve shown them to a specialist because they will need to assess how much space you have, the composition of the ground (if you are installing a below-ground swimming pool), the type of building material they will need to use and how the filtration system will work. Once you have the nitty gritty sorted, then you can play around with your swimming pool design and think about position, shape, depth, extra features and the design of the surrounding area. For hot tubs, you can consider the material you want to use, if you want a deck platform for your hot tub installation, the size and shape and the number of jets. Hot tub and swimming pool installation or construction can begin after the builders have fully assessed the area and measured everything out. With concrete, below-ground structures, excavation will be first and any groundwater will be drained away, the base levelled and drains installed. Then a steel mesh will be installed ready for the concrete to be poured in and concrete blocks to form the walls. Next, the concrete should be rendered and painted with rubberised, waterproof paint, tiled or lined with a waterproof material. Before making doubly sure that all drainage and filtering systems are working, the pool can then be filled and used. Swimming pool builders will know the ins and outs of the swimming pool installation process, so talk to any local specialist if you have more questions. While the hard part may be over, there’s still quite a bit to do after your hot tub or swimming pool installation. Swimming pool maintenance is important if you want to keep your pool clean, hygienic and looking its best. Hot tubs are even more important to keep clean because warm water is more susceptible to bacteria, so you should make sure you are always thorough with your maintenance regime. To be on the safe side, you can also find hot tub and swimming pool maintenance professionals on Houzz that will service your pool or hot tub for you, supply you with hot tub parts or swimming pool equipment should anything need fixing, and actually repair your pool or tub. Here are some related professionals and vendors to complement the work of swimming pools & hot tubs: Garden & Landscape Supplies, Landscape Architects & Garden Designers, Main Contractors, Landscape Contractors, Solar Energy Installation. How much space do you have and how much of it do you want the pool/hot tub to cover? What will you use the swimming pool for? Swimming lengths, playing, training, relaxing, cooling down? Do you want any extra features? A current generator for an endless pool, a slide or a jacuzzi section? What materials would you like to use to finish the look of the pool or hot tub? Wooden decking? Stone paving? Would you like your pool heated? How many people do you want to be able to use your hot tub or pool at one time? Do you want your Southampton, Hampshire swimming pool builders or hot tub suppliers to help you with maintenance and repairs? Find swimming pool builders or specialists on Houzz. Narrow your search in the Professionals section of the website to Southampton, Hampshire swimming pool builder or hot tub supplier. You can also look through Southampton, Hampshire photos by style to find a swimming pool installation or hot tub installation you like, then contact the specialist or builder who designed it.